The workbook used by GriefShare participants features a section for taking notes on each video, a daily "From Mourning to Joy" Bible study, perforated "Care Cards" and other resources. One needed for each participant. 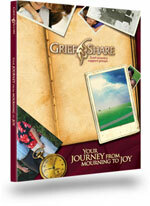 The workbook can only be purchased by churches using the GriefShare series. Minimum purchase of 4 workbooks.